I haven't read Mary Stewart in a loooong time, and I'm not sure I ever read this one. Or maybe I just forgot because I had a similar reaction as you did. Beth F - There are so many authors I want to read, and will probably try several before returning to Stewart. I enjoyed this one, although it was a bit emotionally overwrought in places. I think the theme of mistaken (or unmistaken?!) identity was done better in Josephine Tey's Brat Farrar. I am not familiar with Mary Stewart's work. I enjoyed reading your thoughts. Pat - Thanks, this was a fun RIP read! The plot sounds like a movie I've seen. Kathy - This would make a great movie... wonder if it's been done?? This looks like a lot of cozy, mysterious fun! Man, this sounds so good so I hate that it wasn't a winner for you. I will definitely have to check out this author, though. Picky - This was good, not great, but I would not rule out reading more by Stewart. She has such a loyal following! Seems like one I might enjoy - sorry it wasn't a bit better. Diane - I love this kind of story. It was well done, just not a favorite. I have never read her, but I love the cover, and I love that kind of story as well! Jill - You might like this one! When I was a teen/young adult I read all the Victoria Holt/Mary Stewarts I could get my hands on. That was my go-to genre for several years. I liked Stewart's books, but I remember liking Holt's more. I guess you know that Victoria Holt is Jean Plaidy also and another name not coming to me at the moment. Rita - I didn't know Jean Plaidy was the same person, too! 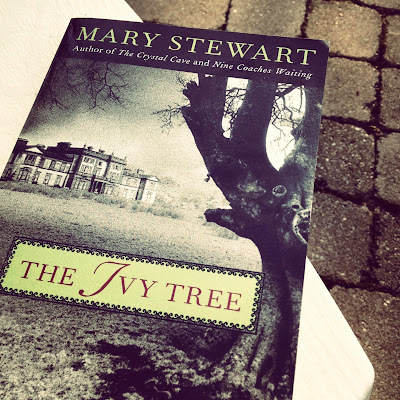 Nikki-ann - This is the perfect time of year for a story like The Ivy Tree! JaneGS - I just loved the setting... the opening scene was perfect , too! I really need to find some Mary Stewart - I like the idea of something between a cozy mystery and violence. Lisa - I like books that fall somewhere between cozy and violent... The Ivy Tree struck just the right balance. I haven't read Stewart yet, but I know I've got 9 Coaches Waiting around here somewhere. Stacy - Nine Coaches Waiting will be next for me, but not until next year.